December 6th is the anniversary of the Arctic National Wildlife Refuge, designated so in 1960. 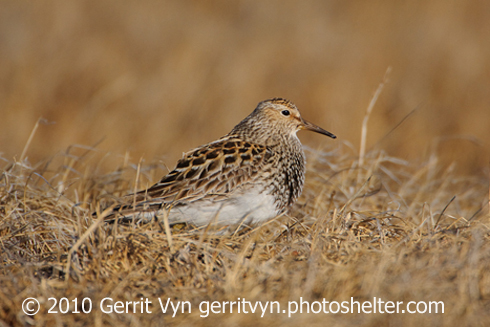 The Arctic coastal plain is probably the most important place in Alaska for the widest number of avian species - including this Pectoral Sandpiper - and the greatest number of birds. Ironically, that habitat type has the least protection in the entire state. From the American Birding Association to the National Rifle Association, groups are joining together in support of wildlife refuges. From the American Birding Association to the U.S. Sportsmen’s Alliance, from the National Audubon Society to the National Rifle Association, groups are joining together in support of funding to maintain wildlife refuges. Learn how you, too, can help. Begin at our website, BirdNote.org. Pectoral Sandpiper, Co. Wexford, Ireland.